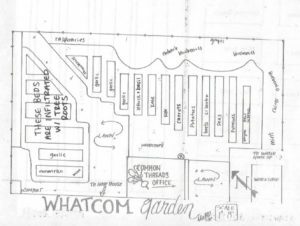 Whatcom Middle School is Common Threads headquarters, featuring a large, diverse garden that includes annual production beds, a perennial food forest, and a hoop-house for season extension. There is a rainwater harvest tank that provides water well throughout the dry season, with an adjacent rain garden and native plant garden. Strong teacher support allows many exciting projects to happen at Whatcom. In 2018, Middle Schoolers studied Mason Orchard Bees and built beehouses, the 7th graders designed their own native plant garden and the 6th graders grow, water, and tend their own starts. 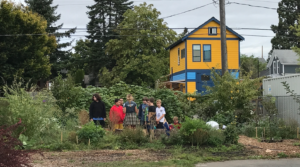 The abundance of food that comes from Whatcom Middle School is used in the cafeteria, school cooking classes and for the annual Common Threads Harvest Dinner (click here for a story about the 8th Annual Harvest Dinner!). 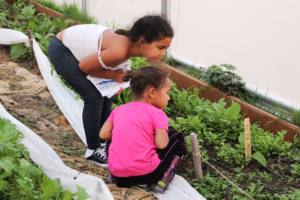 Whatcom Middle School garden has a total of 1,303 square feet of growing space. It is located at810 Halleck Street, Bellingham WA 98225-3243. If you’re interested in getting involved, Whatcom Middle School has a Common Threads Facebook Group that you can join!